A replenished infill will support and protect the synthetic fibres, restore the correct drainage properties and help to improve overall player experience. To avoid the expense and hassle of resurfacing, call Technical Surfaces on 08702 400 700 to discuss a Rejeneration® of your artificial pitch with an experienced Technical Manager. Despite the concerns raised and warnings issued in the weeks leading up to winter 2011, the disruptive snows and frosts that we have endured in recent years have – on the whole – failed to materialise. Certainly, the number of calls we received regarding snow, frost and ice has been minimal when compared with previous winters. 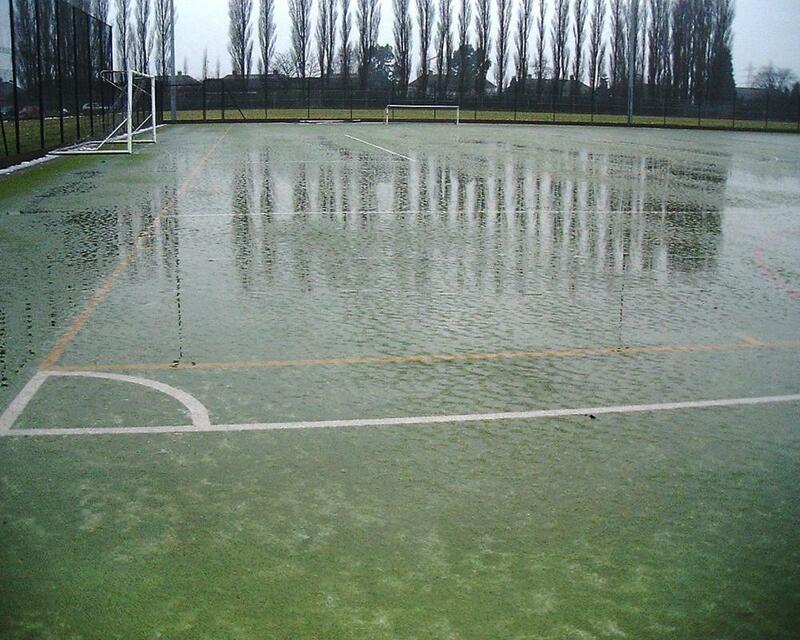 However, the relatively mild, wet and windy climate of the past few months has highlighted a serious problem affecting many artificial pitches – flooding caused by inadequate drainage. 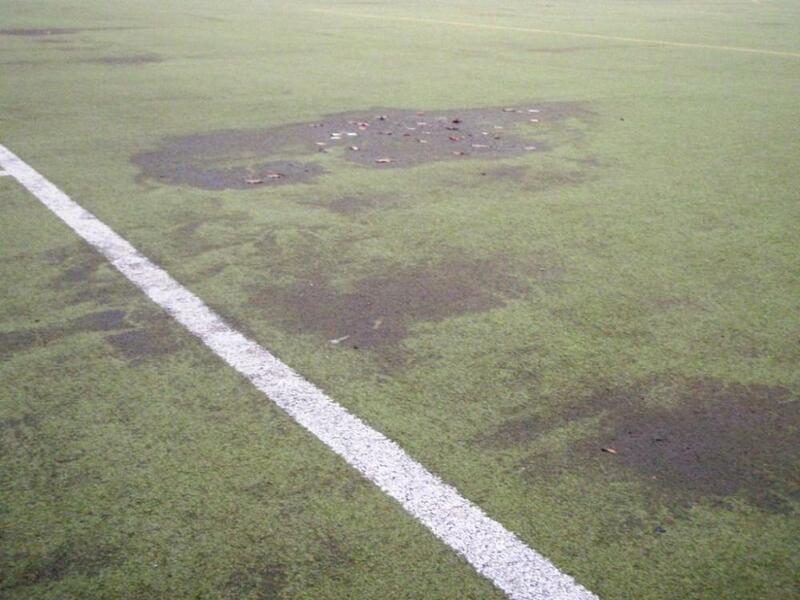 Owners and operators of astroturf pitches across the country contacted Technical Surfaces for help in getting their artificial pitches back up and running; many of which were forced to close altogether, due to standing water or else the potentially hazardous mud and silt deposits that remained when the water did eventually drain away. A number of factors including age, frequency of use and the amount of maintenance in place can affect the drainage capabilities of artificial pitches. 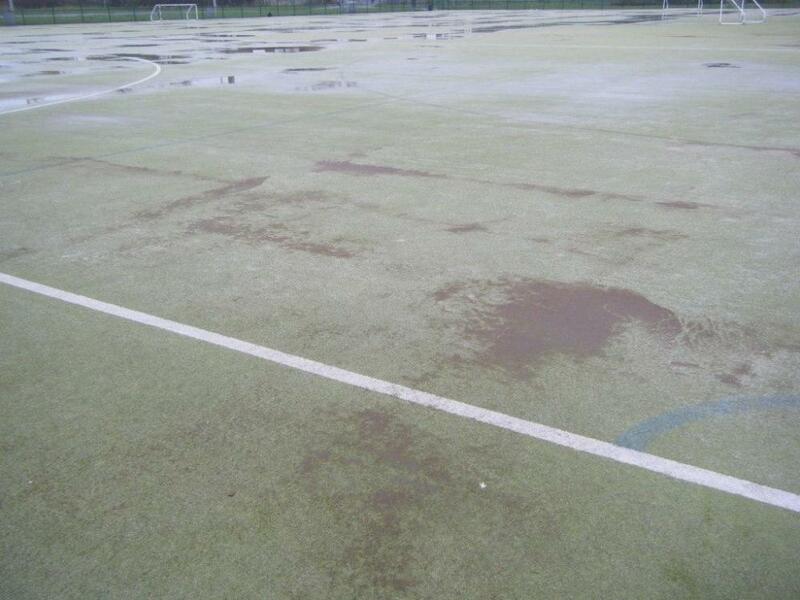 Astroturf pitches require a good maintenance programme in place from day one; failure to regularly remove dirt, leaf debris and other detritus will lead to contamination of the infill, which in turn prevents rainwater from draining freely through the carpet. Frequent Drag Brushing is an important and worthwhile procedure, and in lifting the carpet fibres and redistributing any displaced infill forms the backbone of any maintenance programme. However, on its own Drag Brushing does not remove fine particles of dust and debris from the artificial carpet which, over time, forms an impermeable ‘skin’, acting as a barrier to rainwater and preventing it from draining away properly. Technical Surfaces can combat the problem of infill contamination at an early stage in the life of an artificial pitch with regular Sweeping – lifting and cleaning the top layers of infill whilst ensuring an even distribution of infill across the surface. This can then be complemented on an annual or biannual frequency by a summer Revite®, which addresses contamination at a deeper level using a more intensive cleaning and filtering process. Ultimately, however, whether it is the result of insufficient maintenance practices or simply the age of the artificial carpet itself, the likelihood is that rainwater will eventually fail to drain away completely. At this stage, the infill will have to be removed and replaced via a deep-cleaning process such as the Rejeneration® by Technical Surfaces. A replenished infill will support and protect the synthetic fibres, restore the correct drainage properties and help to improve overall player experience. The only realistic alternative is to resurface the pitch – at considerable expense – but in most cases this is an avoidable outlay when an extra five years of use can instead be secured (and additional revenue generated) by a restorative deep-cleaning process such as the Rejeneration®, followed by an appropriate aftercare programme.